How many fungus are among us? 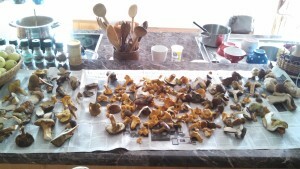 The rewards of mushroom picking in the Czech Republic- but is it sustainable? I’m currently teaching some introductory biology labs and we’ve begun an overview of the diversity of life on earth, starting with protists and other small organisms- my blog tends to focus on the larger organisms that you can see easily without microscopes, and I think there’s a tendency to prioritize those species over the ones that seem small or invisible, even when we are surrounded by them. That seems like a pretty massive disservice to the many, many species that very, very small- hoping to partly correct for this bias, I’m going to step away from the animals and the plants for a moment, and look at a third kingdom. This month I’ll be exploring fungi conservation around the world- and this is a topic that is entirely new to me. Aside from seeing pictures in nature magazines and occasionally finding them along hiking trails, pretty much my entire experience with fungi comes from cooking with mushrooms- delicious, but not exactly conservation-minded. Although I imagine that fungi face many of the same challenges as plants and animals, such as habitat loss, overexploitation, and climate change, I really don’t know how intense or how well-studied those pressures are, so this is going to be exploration of the unknown. But I think it’s time for me to expand the species I think about when I think about conservation issues.